From the pamphlet "Pioneers of the New Age", first published in 1974 by the Vegan Society (pages 18-19). Available as PDF. Learn more about Leslie Cross and the history of veganism. 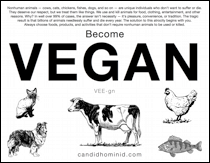 My wife and I have been vegan for thirty two years, two years longer than the Vegan Society and the word ‘vegan’ have been in existence. We gave up dairy produce at a difficult time — in 1942, during World War 2. In 1940 I had become vegetarian because of the price of meat and I had found that there were other arguments to consider as well. Among the things that I found out one was so horrifying that the move onwards to veganism was quite spontaneous. This was the discovery that to make cows milk available commercially we had to take the calf from its mother. I cannot possible explain the enormous effect this had on me: it simply seemed to shame the human race. In common with millions of others I had gone through life so far thinking that cows just provided milk by some benign freak of nature and I had had no idea they had to be made pregnant once a year or so to make their bodies make milk. Finding out the truth ("Put the bull to the cow and when the calf comes, kill it, so that we can have the milk") freed me from taking further part in this enormity. This happened in 1942, and some months later I started off some correspondence in what was then called The Vegetarian Messenger about the morality of vegetarians using dairy produce. Mr. Donald Watson, then Secretary of the Leicester Vegetarian Society, followed up this correspondence by forming a group of non-dairy vegetarians and asking the Vegetarian Society for permission to incorporate this group as a section of that society. Such permission was refused: thus was the Vegetarian Society responsible as it so happened for the formation of what later became the Vegan Society. This was in 1944. The word vegan was chosen from a variety of suggestions, some quite bizarre, and constitutes the beginning ("VEG") and the end ("AN") of the word vegetarian. During the war we had two children, a boy and a girl, and in spite of hardly any data on which to draw, successfully brought them up on a vegan diet. At various times they were subjected to medical tests and came through fine. People commented on their bright eyes, good teeth, clear complexions, and endless vitality. They are still alive and kicking, well-married and in their 30's. My wife and I also survive, now being past the 60-mark, and grand-parents. We are not "food reform". I do not believe that the first element of health is food at all; it is happiness, arising from inward peace. This does not mean that I do not sense and take part in what goes on around me; I am in fact very much in this world. For example, I became acutely aware of the difficulties of doing without dairy produce, particularly milk, and realised that while hard nuts like me might get by without giving way, nevertheless for most people the social strain would not be easy and some replacement for milk would be useful. In 1956 I founded the Plantmilk Society (another invented word). Out of the work of this voluntary Society eventually grew Plantmilk Ltd., formed in 1961 to apply commercially the research carried out by the Society. Some years later (1965) the first can of what is now known as Plamil appeared in a few shops in London. It was made and canned by this pioneer Company in small improvised premises at Langley, Bucks. Now this Company is in much better premises at Folkestone, but with the change of address also came the end of my direct association with the firm I helped to form. The one serious question mark over veganism has been vitamin B12, and I confess I feel there is something in the argument that this vitamin, which is never directly found but as a result of microbiological action, is important for vegan progress. I must give my reason: some early vegans became ill and this frightened off many would-be-vegans. Healthy vegans rather naturally went unremarked. It appears that some human beings have lost the natural ability to use the vitamin B12 synthesised by microbiological action in their own intestines. Some have not lost this ability: therefore there is this confused picture of some people living very successfully after a change to veganism and some not. The conclusion is that the successful ones can utilize their own vitamin B12 and the unsuccessful ones cannot. I am reasonably satisfied that this conclusion is justified and consequently that it is wise to include dietary vitamin B12 in the vegan diet. I do not say it is necessary in all cases (in fact I am positive it is not), but it is a sensible thing to do and can do no harm. Plamil and some other vegan foods have vitamin B12 in their formulae. Where claims are made that B12 is found in plants, it should be recognised that if this is so, it is not because of the plant per se, but because the soil on which the plant has been grown contains microbes which make B12, and the roots of the plant have taken it up. It all depends on the soil, as they say! How you approach a vegan diet depends upon your personality as much as your bodily needs. If you worry, it is important either to dismiss the worry as unfounded, or do something about it. Worry will harm you far more than poor food. As for food itself, common sense plus B12 seems at this present stage to be the answer. Common sense dictates food grown on healthy soil, a reasonable balance between root, leaf and fruit — which includes nuts and grains and pulses — and perhaps in the near future also the new English variety of garden soya bean. But man does not live by food alone, not even vegan food, and needs all the nourishes his spirit. Veganism (which to me means and always will mean the philosophy that man should for his own advancement live without exploiting animals) is merely an adjustment slipping you into a slightly more advantageous orbit. If my wife and I could make that adjustment in the arid and rationed years of World War 2, and bring up children at that time on a vegan diet, what is there to stop anyone doing the same under the infinitely better circumstances of today?